I thought that the jibin was not going to be the multi-day, better-watch-a-video-to-see-how-it’s-done kind of cheese. Such a video does not even exist, by the way, because jibin is supposed to be so simple that nobody, I mean No One, would need a video to figure it out. 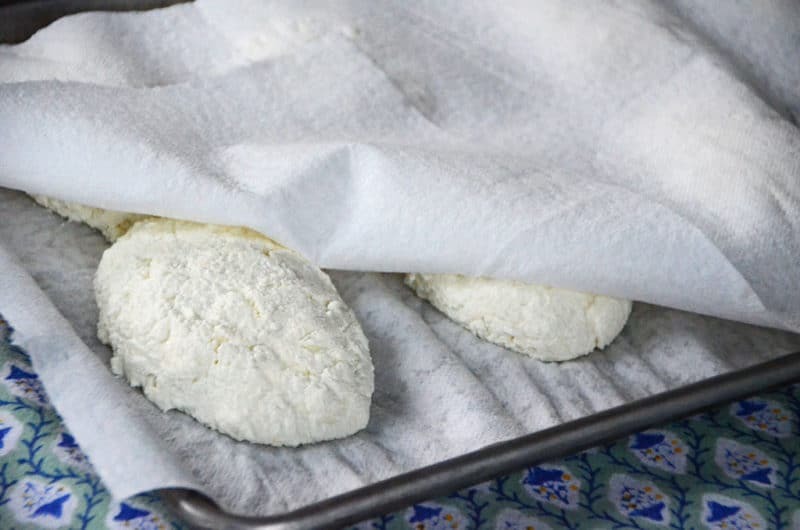 That’s probably one reason this basic sort of cheese became so important and popular in Lebanese cooking and other cuisines the world over (think paneer): just curdle the milk, drain and salt the curds, press the curds together in a little patty, and go get the bread because breakfast is ready. Heat the milk to lukewarm. Crush the rennet and dissolve in cold water. Slowly add the rennet to the milk off the heat and let it rest for 2-4 hours, until the curd forms. Drain and form into patties. Sprinkle with salt. When my first interpretation of the recipe gave me nothing more than a pot of milk, and the same on the second round, I started to get ready to stand up before all of you and declare: My name is Maureen, and I need a jibin-making video. Instead, I picked up the phone and called my great-aunt Awatef, a lady of charm and charisma whose cooking is famous. She walked me through her jibneh-method—she keeps the milk over a very low fire even after adding the rennet until the milk coagulates; she adds a touch of lemon juice; she gathers the curd small-small into patties. In the telling I received the kind of habibi-love you can only get from someone of her generation and grace, with an Arabic accent that gives you the feeling that your quest is not only okay, but absolutely necessary. The temperature of the milk: one woman’s lukewarm is another’s cool. My fingers are always just this side of chilled, and therefore not a great thermometer. Lukewarm, it turns out, is anywhere from 80 to 100 degrees. I went right in the middle at 90 degrees, which by the way was much warmer than my hand’s idea of lukewarm. My jibin turned out best taken off the heat once it reached this temp. The acid. Most of the cheese-focused sites I read call for liquid rennet, but every Lebanese recipe calls for the rennet tablet. And not much of it; one tablet for a gallon of milk seems to be the rule of thumb (and the Junket insert says one tablet sets five gallons, which is hard to believe). When I saw a recipe in one of my mom’s cookbooks that called for two rennet tablets per gallon of milk, I clung to that ratio. I figure this must be something like making yogurt, for which I always add more of the starter than is called for just to ensure the milk will take and become yogurt. Also, I started adding lemon to my jibin milk, a lot more than a drop, and the lemon juice closed the deal every time. My mother made jibin back in the day, shaping hers into neat oblong little patties, but it’s been years. She doesn’t recall having any trouble with it, of course. I remember her cheese was soft, tasted gently of milk, and had an open texture like feta. I couldn’t help but wonder, though, if time and nostalgia had painted this with opaque, rose-colored brush strokes. With the success I finally had with my jibin, I discovered that memory did serve me well. Jibin is quietly, calmly delectable and reminiscent of something, even if you’re not sure what. Perhaps more importantly, I found that what appears simple is often more nuanced than it seems. And nuance is good; it invites a deeper look-see. Likewise, making jibin reminds me why I am compelled to do what I do, and why so many of you are here too. Comes a time when there is no longer a graceful voice of an elder waiting for our calls. Comes a time when we become the ones to make and to give the recipe, plus the habibi-love right along with it, and we best be prepared. Jibin is a fresh cheese with an open texture, similar to Greek feta but not as salty. 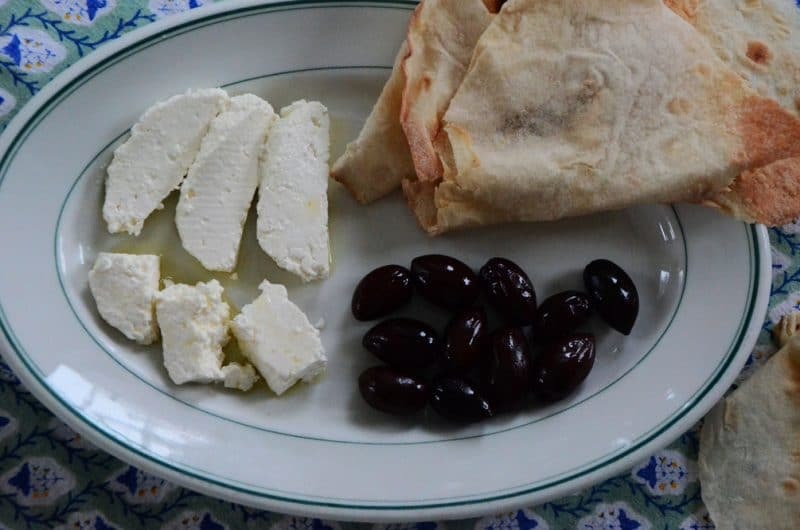 Typically eaten for breakfast, jibin is a delicate counterpoint to olives and delicious drizzled with olive oil and eaten with tomatoes, cucumber, mint, and flatbread. The flavor of jibin is always as good as the milk used to make it. Store the cheese in brine and eat within a week or so of making it. Makes about 4 5-inch patties. The recipe can be doubled easily. In a large stainless steel (not aluminum) pot, warm the milk to 90 degrees Farenheit, or lukewarm. Remove from the heat. Crush the rennet with a mortar and pestle (or a makeshift one; the handle end of a large knife or spoon in a small bowl works well). Add 2 tablespoons cold water to the rennet and stir to dissolve completely. Gently stir the rennet mixture into the milk. Add the lemon juice and gently combine. Within a few minutes you should begin to see small pools of a yellow liquid forming in the milk. This is the whey separating from the curd. If the separation doesn’t appear to be happening, add more lemon juice. Cover the pot and let it rest, undisturbed, in a warm spot for about an hour, or until a soft yogurt-like curd block has formed. 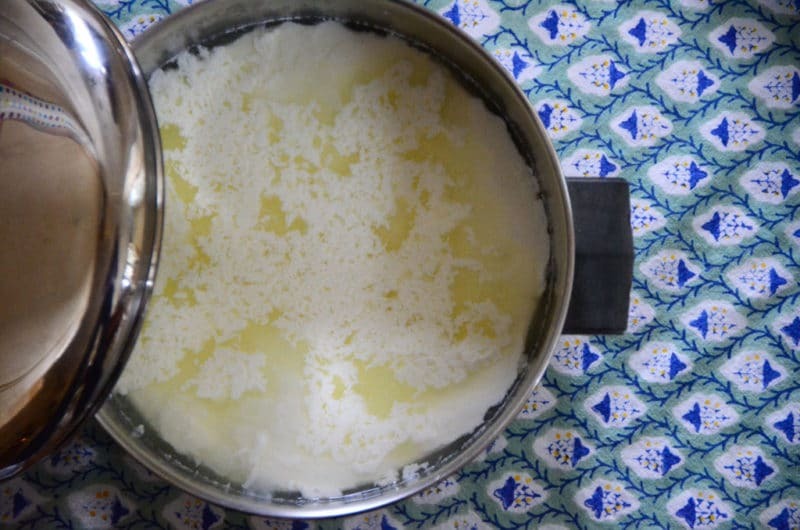 There will be a separation around the edge of the pan where the formation of the curd is most evident. Break up the curd (into the whey) with a whisk into pea-sized pieces that resemble cottage cheese. Let it rest in the pan to settle for 30 minutes. 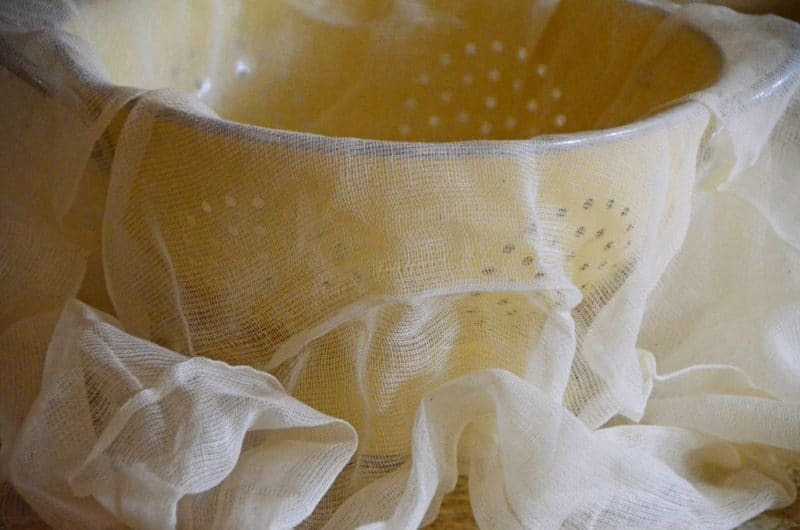 Line a colander with a single layer of ultra-fine cheesecloth. Pour the curd into the colander (the curd will seem very wet and not particularly separate from the whey at this point; don’t worry, the whey will drain off and the curds will be evident). Drain the curds for about an hour, stirring regularly to be sure the whey drains evenly. Line a sheet pan with white paper towel. 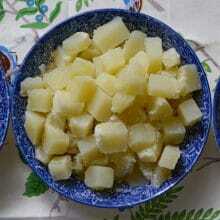 Lightly salt the curds with a tablespoon of salt, stirring completely. Scoop a large handful of the curd and use both hands to shape the cheese into a round or oblong patty about 2 inches thick at the center, pressing out excess whey as you go. Place the patties on the lined sheet pan and lightly cover with more paper towel. Refrigerate overnight. To store the jibin, place whole or cut up patties in a jar and cover with brine (1 cup warm water to 2 tablespoons kosher salt; bring to room temperature or chill before covering the cheese with it). 45 Responses to "Lebanese cheese:Jibin, with habibi-love"
It’s great to hear a professional cook also fails from time to time. You didn’t give a good measurement for the lemon juice. And can one use bottled lemon juice (Real Lemon) rather than fresh? I was also wondering: When we made homemade butter we always washed it to remove all of the buttermilk. Would it help remove the whey if one washed this or does the leftover whey add to the flavor? Thanks for giving me some of the recipes that were lost as the older generation went away. I hope I can pass some of these along to the next generation so they aren’t lost again. Roger, fresh lemon juice is always better for flavor, I think. I don’t buy the bottled juice! But I imagine it would work. Use 2 tablespoons for 1/2 gallon milk, and more if the milk doesn’t take. Maureen, I’m so thankful I found your website. My mother and aunts are not with us anymore to give me these precious recipes, especially jibin. I have most of the basic recipes, written quickly on bits of paper that I have kept for many years.Certain ones like jibin which, Mum made often , I didn’t think I would make at the time, so, thank you for yours.I look forward to many more! This sounds so good, Maureen. I love that you called your Auntie………..we must remember to call the older ones and not be too busy to do so, for one day, they will not be there to answer. I am inspired to try to make this cheese and I think I would like to eat it with sliced fresh red pears in the mid-afternoon since I am not much of a breakfast person at all. 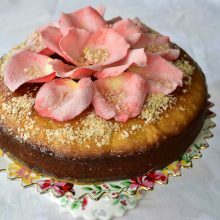 Thanks for sharing this wonderful recipe and story. Love this… I see fertile ground for exploration. I want to try this method with our local Shetler’s milk and will also do my best to get my hands on some freshly squeezed, unpasteurized milk. Terroir! I’m also intrigued by the substitution of acid sources, say white wine (or white wine vinegar) for lemon juice. And fat content; what variations can be created by varying that? And what about aging? 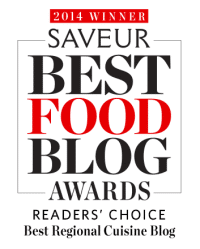 This may become my next culinary obsession… !!! This post gives me such comfort! Isn’t it maddening when the simplest things seem so out-of-reach? I used to have this issue with “instant” foods like quick set pudding or Jell-o. Now my nemeses are at least real food. Thanks for working out the kinks for us. Looking forward to trying it! Paul! Thank you! I have noted it! I was inspired to make Jibin over the weekend and it seemed to be working out just fine, but when I checked my jar this morning, it looks like some of the cheese disintegrated into the brine. Is this normal (I know, I know, is anything really normal)? It seemed dry enough and well formed after resting on paper towel in the fridge. Would love some advice for my next batch! Adele, this does happen because the cheese is so soft and needs to be eaten up within a couple of days. Try drying out the cheese even more by draining it longer and then changing out the paper toweling and letting the cheese drain longer before cutting it up. So glad you made jibneh! I’m not sure if I have stainless steel pots of aluminum. Does aluminum change the flavor? Hi Leigh Ann–yes, avoid aluminum pans when making yogurt! Great to read your article. I have made Jibin before, but lost my tablets. Didn’t know they were Rennet tablets until I read your article. Just knew where to get them when I lived in Cleveland. “The Middle East Bakery”. But the most important part was to use your hands and squeeze the excess water out of the cheese and make the cheese patty. That way it would not fall apart. Hi! 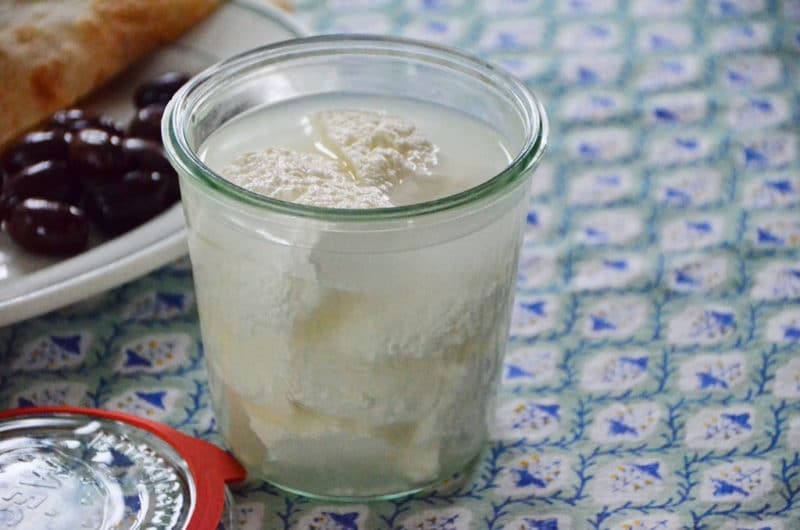 I am trying to make my grandma’s Syrian cheese recipe and am having a similar problem to you– the milk won’t set. It’s lumpy. I think I will try the lemon suggestion. But I’m also wondering– since her recipe (1 gallon of homogenized milk, 3 tablets Junket, salt) always worked for her– could it be the milk I’m using? I realized the one I bought was Ultra-Pasteurized. I’m assuming the best would be to get one from a farmers market– but are there any store bought brands or type’s you’d suggest? Thanks! Hi Stephanie! Great that you are sticking with it. I suppose the milk could be problematic ultra-pasteurized. Try an organic whole milk…and let me know how it goes! I usually make it during the winter holidays to give as a special treat. Does it matter it the rennet is vegetable or animal? I have found that different recipes call for different amount of rennet tables from 1/2 to 1 per one gallon of milk I guess I will try yours. Thanks, was looking for this specifically, much appreciated. A small note though, habibi-love would be from your grandfather, not grandmother habibti . . . 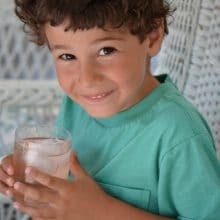 Loved the article, I have never heard of using lemon juice in the recipe. I have warmed the milk as your recipe says, but my Mom and several of her sisters found out that by putting in the rennet tablet from the start and then warming the milk with medium to high heat, you could speed the process by constant stirring of the milk with your hand, as the milk warms and you consistently stir, the setting process takes place quicker, and hence you can do the whole process from start to finish in half the time or less!! I do press the patties in my hands, wringing out the water in forming round patties approximately 3″ in diameter. I consistently get 12-13 patties out of a gallon of whole milk. I let the patties set on a plate and drain extra water as it settles out, then when the patties are dry enough, put in the brine mixture for storage. I have taught many to make it this way, and the results have always been good for all. Everyone who tastes the cheese falls in love with it! I am intrigued and surprised that cottage cheese isn’t a grocery store staple in Lebanon. If I find a source, I will let you know! Ellen, you are not alone! The jibin is so finicky I decided to leave it out of my cookbook! Try a squeeze of lemon juice but also, is the rennet fresh/recently purchased? That can play a role. where can I buy fresh rennet ? Hi Audrey–I buy rennet drops that are in the refrigerator section of our organic foods store in town. If you buy Junket, check the expiration date. Maureen! Thanks for demystifying jibin! You have no idea how much milk I’ve wasted over the years trying to make this seemingly simple cheese. I almost cried this weekend when it finally worked. First thing I did was snap a photo and send it to my mother and little brother, both of whom have also dumped an embarrassing amount of failed jibin-milk down the drain. Thanks for all you do. This is so great Anthony, thank you! Can you tell me what is cottage cheese in arabic ? or from where i can buy it ? because it’s like impossible to find a store who buy it and even they don’t understand what i want. Hmmm, I’m afraid I’m not familiar with cottage cheese in Arabic! I wonder if it’s not so readily available there? Thank you very much for your blog and in keeping the compulsory tradition of Lebanese people – always being a little more than personal. Regrettably, I didn’t learn a thing about cooking from my mother so I cannot contribute any useful ideas to your recipes. I will say however her joban was very smooth but yet not too stiff, perfect. She pressed them with her hands only and they looked like small cakes of cheese. Before salting, she always left one for me to eat because I loved joban with salt AND without salt. There was nothing in the morning like fried eggs, zaytoun and scooped up with fresh fried khoobz. P.S. Is there anything better than koosa with laban and khoobz araby? Thank you Father Raphael for this special remembrance of your mother. Now you have me craving koosa with laban, gonna have to make it soon! I made my first batch of Jibin the other day and it´s actually how I found your blog, as I was unclear about a part of the procedure and asking google to help me out. It turned out beautifully, although I went with 1 tablet of rennet for four gallons of milk and now lemon juice. The patties came out a bit softer than I remember from Lebanon, but I guess I´ll just have to let them drain longer next time. I will also try your version with the lemon juice next! Thanks for the beautiful blog, I now have a new cookbook on my wishlist! How great Claudia–I’m impressed with your jibin! Thanks so much for sharing! I have been making yogurt and cheese since I was 17.
yogurt, must boil the milk first and bring temperature down to 118 deg F. add the starter yogurt and cover for 6 hours, the longer you can keep the temperature at that level the firmer the yogurt will turn out. jibin. as you have described I use 95 degrees F as a goal, Homogenized milk is best to get more cheese out of it. If you save the whey (the water left over) after you are done and boil it again, you will get Ricotta cheese. If you live in the city your best bet is the grocery store for milk, But if you know a farmer or you are near a farm and the farmer is willing to sell you some fresh milk then you will see a big difference in quantity and quality. If you are in Canada, it is against the law for the farmer to sell directly to the public (some stupid bureaucratic BS laws). In the US farmers are just happy to take the cash. Visiting your web site and looking at the Lebanese cheese recipe brought me a little closer to my now deceased Lebanese family. I miss them very much and I am grateful to Mom and my grandmother for teaching me to cook the traditional Lebanese food. There is nothing better. My youngest daughter, who is one of my five girls is a great cook and tries her hand at making the food. She does really well and carries on the tradition. Thank you for the cheese recipe. My mothers salata and bread was out of this world. I watched my grandmother throw that bread around until it was thin as paper. I haven’t mastered that yes. God Bless Love your site. How special Rosemary, thanks so much! Hi Maureen, I have similar memories of my Lebanese mother’s homemade jibn. I also have experienced difficulties in getting firm enough curds to press into patties. I have discovered that returning the pot to the heat after you cut the initial curds makes all the difference. My mom is not with us any more, so I got the tip from my aunt. Once I started heating the curds, I’ve never had a jibn fail! WOW! Thank you Marcy! I’m trying this!
. Hi. Well we’re trying to make jibn here on a visit to San Miguel de Allende Mexico which increases the challenge for sure. Thanks for all the tips – and the lovely memories. My Sitee is no doubt smiling down on all of us. How great is that Carol?! Thank you for sharing and I would LOVE to visit Seattle and all of you one day! You have that beautiful, generous Lebanese hospitality! Yikes! What did I do wrong? For 1 gallon of whole milk, I used 1/4 tablet fresh rennet (the package said “1 tablet makes 50Liters of milk”) Sophia of Greek/Lebanese grocery store said to use 1/4 tablet. Everything went according to recipe, until the draining with the cheesecloth. It stopped draining after 10 minutes. I started draining at 5:00 pm. Here it is 9:00 pm and it’s still too wet to form patties. I struggled by putting small amounts in a fine stainless steel strainer, one patty at a time. Placed them on paper towels and within minutes had to change the towels because they were so wet. (Broke up the patties because they weren’t set.) Well, here it is almost 11:00 pm changing the soaking wet paper towels. Hope this is the last “diaper” change. I don’t remember my mom draining them in cheesecloth. I do remember after they were set, still in the whey, she would reach in the pan and be able to form the patties squeezing out the whey. Next time I’ll try using more rennet. Any suggestions? Yes, there is a special love in Lebanese families. All my elders are gone now and I hope I can fill at least a part of their shoes. Maureen, milk today is not what is was when my grandmother learned to cook in Lebanon over 100 years ago. Milk is pasteurized at high temperature, and even ultrapasteurized at even higher temp. This is great for shelf life so milk can be moved longer distances and remains salable for longer. But it won’t make curds! It makes only tiny curds that won’t join to make a solid cheese. I found that low temperature pasteurized milk works just as your great aunt expects. I live near Philadelphia, and we have an organic creamy that pasteurizes at 165 def F, and you can find their milk from Harrisburg up into New York City: Trickling Springs Creamy. I’ve made great cheese from their Organic or Farm Friend whole milk. Any low temperature pasteurized milk will work. Look for it! I sure will, thank you Richard!